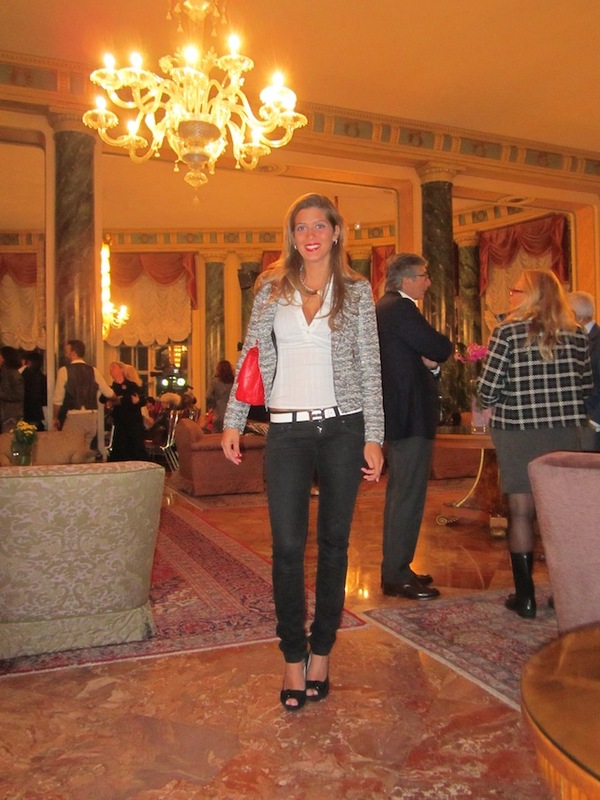 Fashion show at the hotel Excelsior | Cosa Mi Metto??? 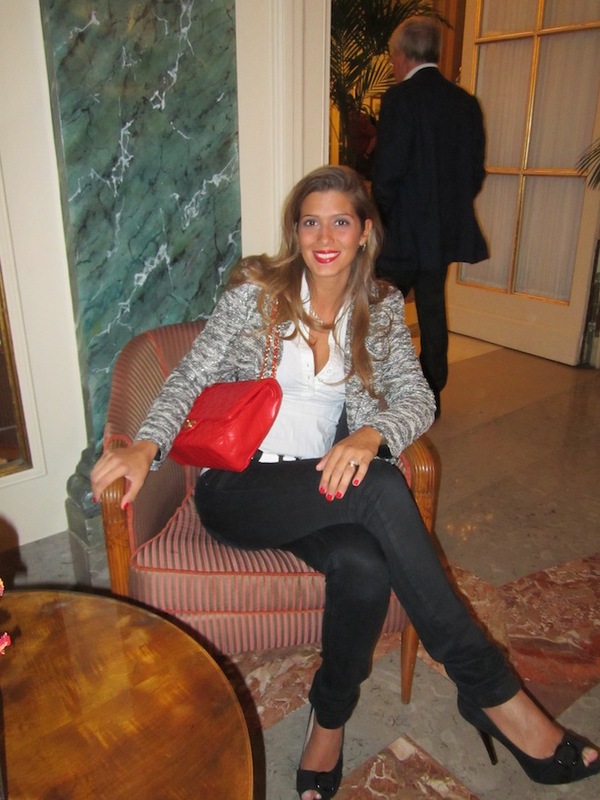 Yesterday at the Hotel Excelsior took place the fashion show of the italian stylist Alessio Visone. This is the elegant look I choose for the occasion! Do you remember my red Chanel? Ieri all'Hotel Excelsior c'è stata la sfilata di moda dello stilista italiano Alessio Visone. Questo è il look elegante che ho scelto per l'occasione! Vi ricordate della mia Chanel rossa? Same photos of the fashion show, the main theme was the garconne mood. Alcune foto della sfilata, il tema principale era il mood garconne. Last day to enter this wonderful giveaway..
Ultimo giorno per partecipare a questo fantastico giveaway..
Great look! Love your jacket!! bellissima la chanel! molto carino anche il look, forse avrei eliminato la cinturina bianca. Hello, you have a lovely blog. like your jacket! and your bag is stunning!! What a perfect look for this event! I love that blazer and your bag! You look so beautiful! lovely greets and a wonderful week. Great pictures. I imagine that you would enjoy. love your outfot. It looks very chick and classy! Very sophisticated look! Love your jacket/ blazer! Love the red lips matching your Chanel purse. Great fashion show! I like the outfit especiallly the bag and nail polish - chic. PS Thank you for the lovely comment on my blog. You look very elegant and I love the pictures you took! looks like a fun event! great outfit you wore! Love your style, amazing jacket BTW!! If you like, follow me as well!! i love your jacket!is perfect! Love the outfit! the bag is amazing and the jacket is so cute! la borsa sta davvero bene su quel balzer! Love your blazer and gorgeous red Chanel. That fashion show looks like so much fun! bellissima!! gorgeous!! divina!! jaja love your look so style and classy. you got a classy and elegant style, beautiful red handbag! I like the jacket too! Thanks for stopping by my blog! LOVE the outfit & the bag!!!! Gorgeous as always! love your purse!! Estas muy guapa, la chaqueta tweed me encanta y el bolso le da el toque de color. Love your jacket and the black dress with the yellow gloves! Love your look. I follow you. your jacket it's so nice! mi piace la tua borsa, bellisima. You are so regal with your outfit. nice blog , i love your clothes ! Esa cahaqueta es muy bonita. It must have been a great event, I love those outfits! You looked simply stunning!! The red Chanel is amazing, and so was the complete outfit! Bellissima la borsa, ma anche il rossetto... meraviglioso punto di rosso, ti sta davvero bene! il look che hai scelto è davvero molto bello! ti aspetto da me ...non vedo l ora di sapere che ne pensi! Thanks for visiting my blog and post a comment. Keep in contact, I'll visit you diary. gorgeous jacket! love these photos! I love your outfit! following :) thanks for commenting on my blog! Lovely! You look gorgeous, and the Chanel bag is sooo pretty. I adore your blog. i agree, very elegant indeed. i love it!! yes the picture is beautiful! I took the picture last week!!!!!!!! !so happy! You have a very nice blog!and I like ur look so much! Thank you by the way for your comment! You look amazing! Love red, black, and gray together. I love the jacket is great!! Hi sweety, you look stunning as always, the red bag is such an eye-catching piece! Very pretty outfit. Love that jacket! Wow, cool look, and love your bag! I like your classic outfit! You're so pretty and I really love your bag!!! Love you jacket! Love your bbag! Love y0ur blog. I follow you! I love that Chanel handbag and your blazer also! So pretty. and great photos of the show. Their is a giveaway on my blog I think you will love, pass by to enter! incredible your look honey, i really love the bag, the jacket... perfect!! bellissima , sempre molto elegante!!! Thank you for share everyday your opinions, it's so important to me! Grazie per condividere ogni giorno la vostra opinione, è così importante per me! What a beautiful outfit and show! And thanks for passing by. I hope to see you again in my blog! So classy and chic outfit! Love this bag!! And the jacket!! Check out my blog and follow me! love love your style too! Gorgeous look! I'm jealous of that red bag! What amazing pics. Love it, You look stunning!! Love your outfit! Esp. your bag! thanks for your comment in my blog! i love your bag!I follow you and i hope you follow me too! Great outfit!!! love you outfit and am in love with the Red chanel bag!!!!! and thanks for checking my blog and your lovely comment! i love love love the red chanel bag! Thanks so much for the comment on my blog! Im following yours now! You have a great blog and your gorgeous! Love the outfit! love your blazer and chanel bag, you look amazing!! BEAUTIFUL... Love the outfit very trendy =D !!!! Would you follow us back ??? Thank you so much for dropping by mu blog. I totally love you blog and sense of style - not to mention your red Chanel, I love it! Thanks for visiting my blog, I am following you now. Great blog, great style = inspirational!! Thanks for stopping by my blog and for leaving such a sweet comment again. I am following you. Hope you will follow me, too? Great outfit! Simple yet classy and chic :) Love that red purse!! You look absolutely great! Loveee your bag!! You have a fabulous style! I will follow your blog! Molto carina la borsa rossa chanel! The blazer and the bag are fantastic!! Love your jacket!! and your are so stunning and beautiful!! Gosh the chanel bag is gorgeous!! I love some of the outfits on the runway also! Hope you had a good time! Ciao Fabrizia, grazie per essere passata da me! Love that red Chanel bag! Great look, the channel bag is so bold! Thanks for visiting my blog, I'm following you and entered your last giveaway. You look amazing! Love that Chanel! that blazer is just simply fabulous girl! and love it pinned with the red bag! So elegante! Thank you for your visit! Following you now!! cute outfit love your blazer! I love that outfit, the blazer and the red channel are amazing!! And of course the fashion show looked really cool. Thanks for checking out my blog, you have my follow! ooohhh i love the bag! i love your jacket!!! and great purse! oohh.. love that red bag..!